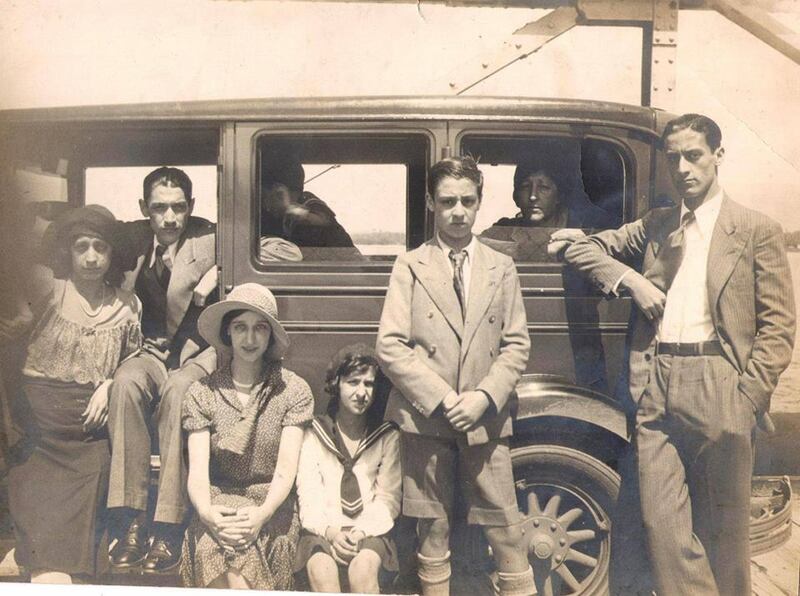 Macedo Family in 1932. Renato is boy jumping up and down the car seat in the middle. 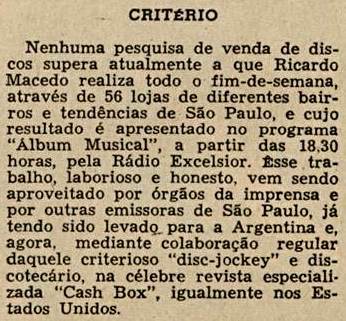 Radiolandia #355, 1961; Ricardo Macedo's Sunday show 'Album Musical' beamed from 6:30 PM to 8:00 PM and counted down the 25 best selling singles of the week on Radio Excelsior. Later on, Macedo moved his show to Radio Bandeirantes on Sundays from 10:00 AM to 12 Noon. Ricardo Macedo was renowned for honesty and precision on his research with more than 56 record-shops spread around Sao Paulo's metropolitan area. His Top 25 was adopted by US magazine Cash Box. 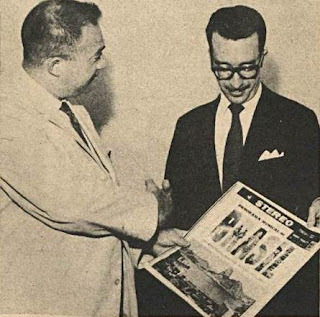 Ricardo Macedo (wearing a moustache and glasses) receives a gift from US record producer Sidney Frey who came to Brazil to establish Audio Fidelity, a brand-new record label. 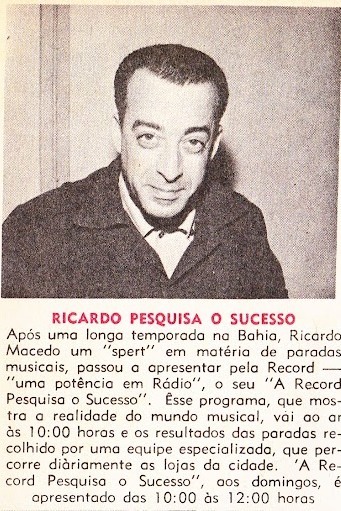 'Correio da Manhã', 10 March 1962, 'Esquina sonora' by Rossini Pinto says: Ricardo Macedo presents 'Album Musical' on Sundays from 6:30 to 8:00 PM at Radio Excelsior - the 25 best-selling singles of the week. 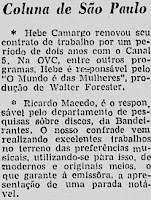 'Correio da Manhã', 7 April 1963, columnist Oziel Peçanha says Ricardo Macedo now is the chief record-selling researcher at Radio Bandeirantes. 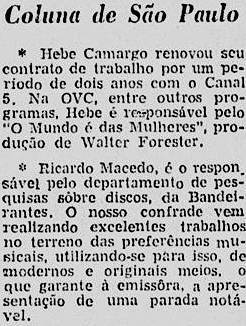 'Correio da Manhã' Rio de Janeiro, 10 November 1963. Ricardo Macedo's Hit Parade radio-show is news even in Rio de Janeiro. 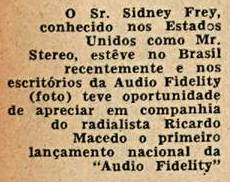 He worked for Radio Bandeirantes then. Ricardo Macedo at Revista Melodias #145 October 1969. Ricardo had a 2-hour Sunday show from 10:00 to Noon at Radio Record after having stayed with Radio Bandeirantes for many years. According to 'Melodias', Macedo had a soujourn of some years in Bahia and now was back in São Paulo doing what he did best: research the best selling singles, EPs and LPs and then counting them down on Sunday mornings.